CEMSA (Elettro Costruzioni Meccaniche di Saronno), was founded in Saronno, Italy in 1925 by engineer Nicola Romeo and the bank "Credit Italiano." In 1935, after a series of speculations in the capital, the company was taken over by the IRI (Istituto per la Ricostruzione Industriale), and a year later was sold to aeronautics engineer Gianni Caproni who then controlled "Isotta Fraschini" . During the Second World War, CEMSA manufactured arms and light at the end of the war period, the industry began producing automobiles through the collaborative efforts of the engineer Antonio Fessio, who in 1946 had left the "FIAT". Within a few months, Fessio projected a car with highly innovative technical features, the F11, which was presented at the Paris Salon of 1947. From this model were only 10 saloons and included a cabriolet version that was never to be produced because of the financial crisis of 1948. One of the prototypes of the F11 was sent to the United States to sign an agreement for sales. 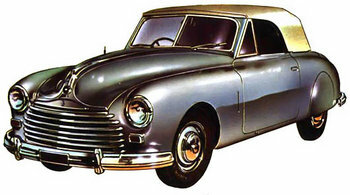 The same sales network, provided to the Tucker company for sales in the United States, but only a few dozen of that model; the project was unsuccessful. The F11 appeared again in the Hall of Turin 1949, but the signature does not put it into production, despite the excitement caused. In 1953 the Belgian company "Minerva", bought the design of the F11 with the intention of putting it into production, but the project was born dead, and failed by his resemblance to the "Hotchkiss-Gregoire" of the time. All the technical solutions were implemented in the F11 series finally in 1960 with the Lancia Flavia, always planned by Antonio Fessio. The body was planned and designed by technicians from the company and finally touched by Bertone.